This soup always reminds me of my hometown, especially of my mother who has taught me uncountable cooking's knowledge without dictating nor patronizing. Those knowledge just unnoticeably absorbed & settled in my memories after years of witnessing or being her co-pilot while cooking ;-). Now I have to drew those memories back while experimenting some recipes with "Try & Error" methods in my own kitchen. Sometimes I get success immediately, sometimes I have to check & re-check to my main resource alias my mother when failure occured. I just want to satisfy all parties, especially those of you who want to learn to cook Indonesian dishes or maybe just try a new recipe . 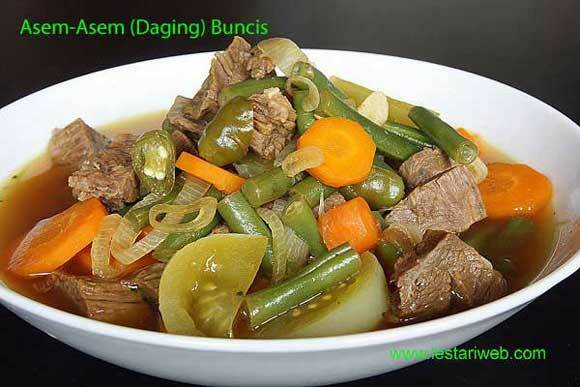 Maybe you have come accrossed to this beef-vegetable soup somewhere in Indonesia? Or just curious to taste a kind of new soup ??!. Then you can start with this simple but delicious soup. The taste is a perfect combination between mildly hot, sweet & sour. Served with rice & savory crackers..hmmmm it freshes my throat already !! For those of you who are vegetarian, just take away the beef out of the recipe. It still taste good!! Boil 2 liter water in a large saucepan. Then add the beef ***. Cook the beef over medium heat (to obtain clear stock) until the beef getting tender. (Skim off and discard the fat that floats to the water surface if necessary). When the beef is well cooked, take out from the pan and cut in pieces. Keep about 1.5 ml from beef stock, add more water if necessary. Put back the cutting beef into the saucepan. Keep aside. Add the bean and stir to mix. Cook until the bean half cooked. Stir all the time to prevent burning then add the fried spice & bean into the beef's pan. Soak the tamarind pulp in warm water. Squeeze the tamarind pulp constantly to extract the flavor into the water. Add the tamarind juice & stir to mix. 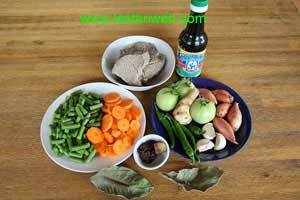 (Add tamarind together with it's pulp to get the optimum sourness). Add kecap manis & palm sugar. Adjust the seasoning, add salt to taste. Make sure that the vegetables are not overcooked. Serve hot with rice. *** Add the meat into boiled water then cook over medium heat to preserve it's best taste.